In this second edition of the Blythe Cove Manor series, Blythe Calvert, with her unwavering wisdom, helps her guests discover the hidden secrets of their pasts or an intriguing glimpse into their mysterious futures. A Final Gift by Lorraine Bartlett. An Everlasting Bond by Shirley Hailstock. Sharon Parker's daughter convinced the family to go to Blythe Cove Manor for Mother's Day. Little did she know that the simple act of love would unveil a long-held secret that could bring the family together or tear them apart. 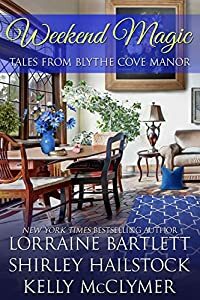 Can Blythe Cove Manor help convince a daughter to reach out to her mother? There’s a gulf between Anna and her mother, caused by an old argument. Will a special New Mother gift of a week at Blythe Cove Manor help Anna bridge the gap? Formerly titled: Mothers and Daughters - An Everlasting Bond.